A Sri Lankan emerged with the top marks in the world across two subjects in the 2017/18 academic year examinations conducted by the Institute of Chartered Shipbrokers, UK (ICS UK). Nabeel Hamza will be felicitated together with his fellow graduates at an award ceremony conducted by the Institute of Chartered Shipbrokers, UK at the Trinity House, London later this month. Notably, the Chief Guest at this year’s award ceremony in London will be UK MP, Nusrat Ghani, Parliamentary Under Secretary of State at the Department for Transport and Assistant Government Whip. The first non-British International President of ICS UK and Chairman of the Sri Lanka Ports Authority Dr. Parakrama Dissanayake will also attend the event as guest of honour amongst a distinguished gathering of international delegates. Nabeel won two world prizes for both subjects he attempted, securing the Armac Award for ‘Introduction to Shipping’ and E.A. Gibson Shipbrokers Award for ‘Port Agency’ – making history as the first Sri Lankan to win two world prizes together at the ICS UK examinations. A 34 year old professional with over a decade of presence in the industry, Nabeel shared some insights into his journey to the academic pinnacle in international shipping and logistics. “I am delighted with my achievement and very excited to know that my ability to learn and perform in a global academic environment has not been dulled, but rather sharpened by my time working in the industry, the reason behind my decision to take up this challenging examination was to endorse my experience in the industry,” he said. A past pupil of Zahira College, Colombo, Nabeel is an associate member of the Chartered Institute of Management Accountants, UK and a Lean Six Sigma Black Belt. He began his career in a multinational manufacturing and trading company where he played an important role in accounting and finance. 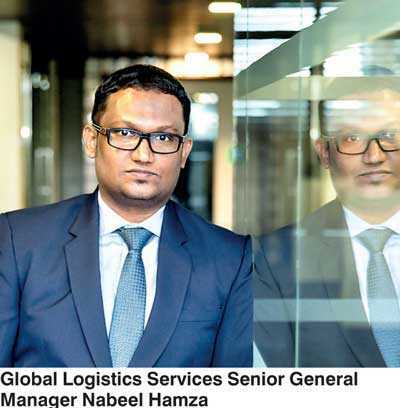 As he identified that logistics is an integral part of the trade, he moved to a career in logistics in 2008 and now serves as the Senior General Manager at Global Logistics Services Ltd.
“When it comes to providing logistics solutions, Global Logistics Services Ltd., is today a company that is big enough to do the job and small enough to do it better. We provide a total suite of logistics solutions and despite starting from humble beginnings as a medium-sized company, we have recorded a considerable growth over the years to reach our market position today through careful stages of product development to fulfil our customer needs. I believe this experience has been instrumental in my success today,” Nabeel explained. The Institute of Chartered Shipbrokers, founded in 1911 and awarded a Royal Charter in 1920, is the only internationally recognised professional body in the commercial maritime arena and it represents shipbrokers, ship managers and agents throughout the world providing the shipping industry with highly qualified and internationally recognised professionals while continuously working to improve professional and ethical standards in the industry.